I’m still ADAMENTLY AGAINST this proposal, even though it will make me more $$$ personally…. 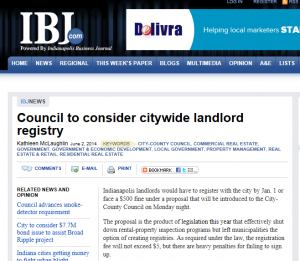 Yes, according to the IBJ article, this proposed legislation will put more money in my pockets…. But whenever real property rights are RESTRICTED by legislative directive, it is only a short term gain and ultimately a LONG TERM LOSS for every citizen. PLEASE, PLEASE read the IBJ article and then CALL and EMAIL YOUR COUNCILMAN OR COUNCILWOMAN to protest this legislation. It will NOT solve any current issues and only puts a larger tax wedge effect on affordable housing, interferes with free market capitalism, and allows further government over-reach into one of the last bastions of our Republic.